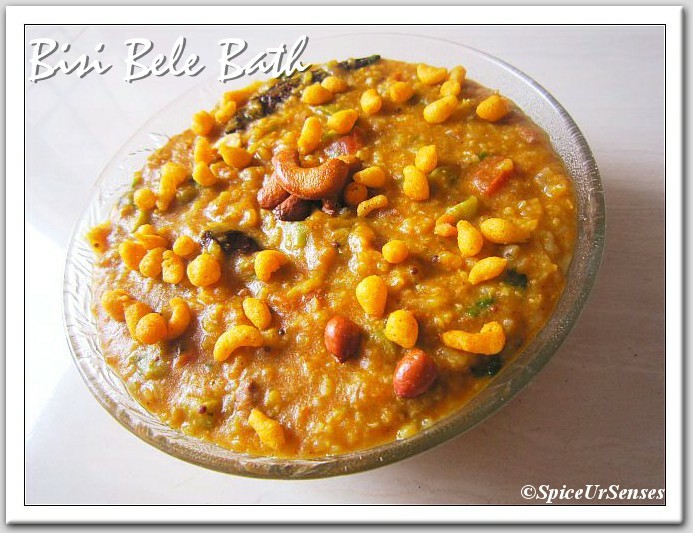 Wash dal and rice and put it in the pressure cooker with 5 cup of water and salt. Allow 4 whistle (1 in high flame 3 in low flame) after the pressure is gone from the cooker then add all the vegetable, onion, tomato, green chilly, ginger garlic paste, and all the masala powder. mix it gently and again cook for 3 whistle (1 in high flame 2 in low flame) In the mean time take a frying pan, add oil and fry cashew and penuts, and set it aside. After the pressure is gone from the cooker open the lid and add the fried cashew and peanuts, Then prepare for the tempering, in the same frying pan add oil, mustard, curry leafs, red chillis and garlic cloves, when they start turning golden brown remove from the heat and add in to the BBB and mix it well. 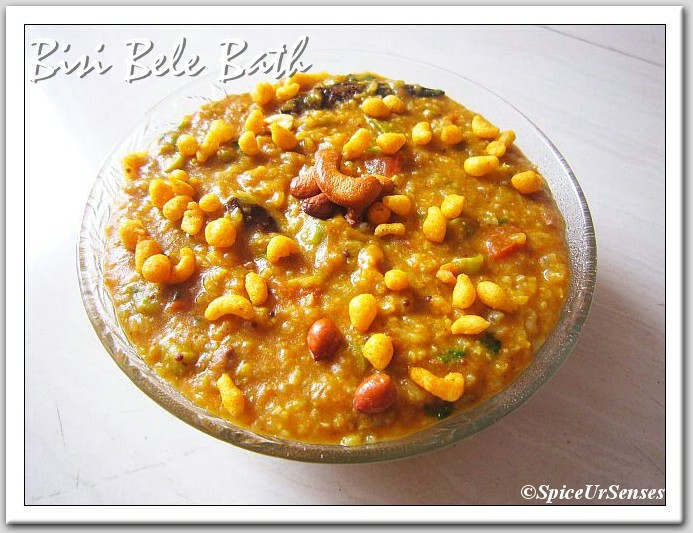 Bisi bele bath is ready to Serve. 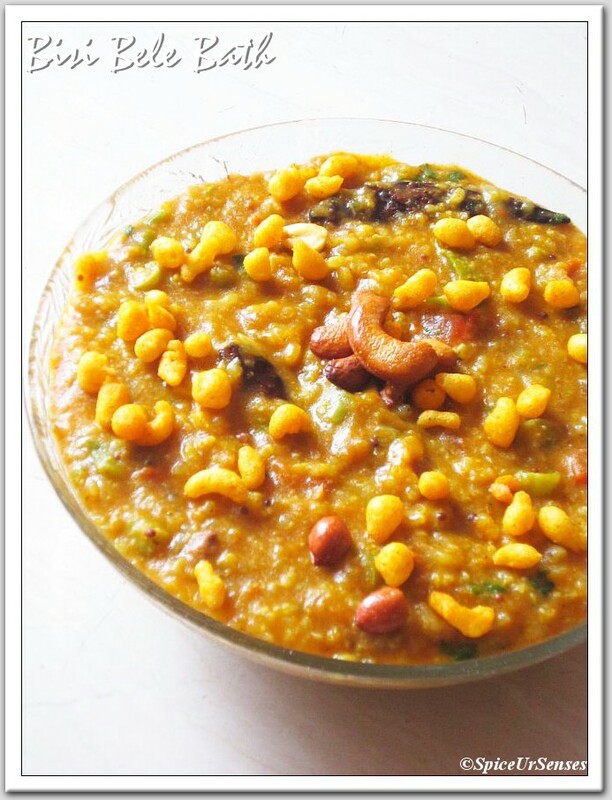 Serve hot with Ghee and Mixture. I love pressure cooker cooking a lot. Saves so much time and effort na? The curry looks delish. Btw, what's bisibele bath masala...sorry for my ignorance! BisiBele Bath masala gives the spicy flavor and taste. You can get in any grocery store selling South Indian recipe masala's. onepot meal is looking tasty .love to it eat it any time. i am following u looking for ur visit. Am actually thinking of preparing the BBB masala powder for quick usage..like this..quick n good one for weekdays..lunch.. Delicious, healthy & comforting one pot meal!!! sure a lovely one pot meal, delicious and wonderful recipe.. I can die for that bowl,my fav anytime..
Hmm.. lovely. One of my fav. Nice and colourful. Amazing clicks. This one pot meal looks fabulous!